Dachshunds, Doxies, Sausage Dogs, Weiners, whatever pet name you have for this breed of dog I can guarantee that once you fall in love with one then you will be a doxie lover for life! 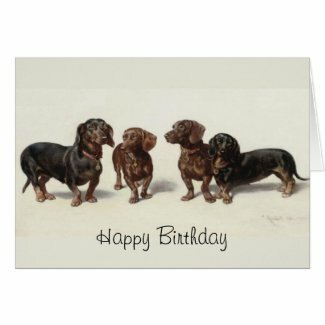 The best way for anyone to celebrate your birthday would be with special Dachshund Birthday Greetings and these gorgeous doxie Birthday cards are the perfect way to kick off your special day. 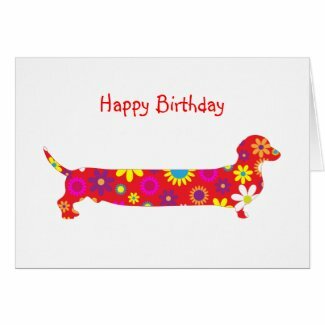 There are lots of different Dachshund birthday cards to choose from, I’ve only featured a few of my favorites, so each year you can receive a totally new card. If you still have your favorite Dachshund at home with you then maybe someone can take a photo and get your very own personalized birthday card featuring your very own Dachshund. This service is available and very easy to do via Zazzle……if you’re lucky they may get carried away and not just get you a card, but a hoard of other gift ideas from canvas prints to mugs to t-shirts, even jewelry. There really is something special about this little dogs, who are ultra protective of their owners (I’m sure they see themselves in their minds as big as a Great Dane rather than their small size!). Anyone who’s had the privilege of knowing one would probably appreciate some of the cute and/or funny Dachshund cards that are available. Birthdays aren’t the only celebration that you can celebrate in true ‘weiner’ fashion, however, there’s also a great collection of Dachshund Christmas cards to choose from too.